Greetings in the name of the Lord. I bring you blessings, my dear friends, as I always do for each and every one of you here, as well as for all my friends everywhere. Before I explain the technical procedure of birth, I will have to talk a little about the spiritual and psychological conditions that govern karmic law, although some of these are familiar in broad outlines to most of you. However, since the technical procedure of birth is directly connected with, and dependent on, karmic and spiritual law, I have to show you the connection, so that you will be able to understand birth as such to some degree. Your next life, my friends, is already prepared now, in some way, by each and every one of you. It is not prepared entirely, for as long as you live on earth, the last word is not spoken and the chances of determining your next incarnation and effecting a change from what you have prepared so far are strong. Your chances for that are much stronger here than in your existence in the spirit world. There you will still have a chance to make modifications although the chances are smaller. It is more difficult to do this in the spirit world because of the fact that life–if we do not include the spheres of darkness–is easier there than on the earth plane. For that reason, development is slower in the beyond and to effect a change is definitely more difficult. Up to a certain point in the cycle of the development of an individual being, decisions cannot be made by the individual. But from a certain stage of development on, each spirit entity has the right, and often even the duty, to make personal decisions about the circumstances of the following incarnation. Depending on the character of the entity, these decisions are not always good. There are people who tend to be lazy; they lack ambition and are satisfied with a certain amount of comfort. They do not particularly strive for higher forms of consciousness and happiness. Their choice may often be an easier life than would be good for them. They still lack the comprehensive view of the purpose of earth existence. On the other hand, an overambitious and overactive person may often choose more than he is ready for. This, too, will hinder progress and cause a temporary setback. Here the entity’s view does not include its own limitations. Similarly, an overoptimistic character may make just as wrong a judgment as an overpessimistic one. As I said before, up to a certain degree of development a spirit entity is not capable of making any decisions, because any extreme in character produces a lack of harmony, which must influence proper judgment. Only when the character becomes more harmonized will the decisions not deviate too strongly from the right middle course. When an entity is not yet developed far enough, decisions are made by higher authority. But even in these cases, the entity is consulted first on what he or she would imagine to be the best life conditions for the next incarnation. This is considered a test, and afterward it is explained to the individual why this or that alternative would be bad or even dangerous and why the decisions made by a trained and highly developed spirit offer a stronger chance for advancement. So, there is a schooling connected with the decision-making and planning for the next life. The entity has to learn something from this alone. I may add that even when, on the whole, a being is not yet able to make its own decisions, it may still sometimes have sound ideas and these are then adopted and those wishes granted, while others must be rejected. There is no definite borderline between the state when decisions are made for an entity and when it is ready to make its own decisions. The ability comes slowly and gradually. From incarnation to incarnation, something is learned in this particular respect too, so that more and more ideas of the entity can be considered. Then there are also cases when the choices made by the entity are still within the realm of possibility, but may prove too difficult–or too easy. In such instances, the higher authority, advising and planning the next incarnation with the spirit to be incarnated, will advise and explain and offer another alternative. The entity then has the right to accept or to reject the advice according to its own free will. Should the entity reject the advice and then, after the next incarnation, find out that its own judgment was faulty, this then will be a good lesson and maybe the only way it could have been learnt. It would never have been convinced of having erred if not left to follow through on its own ideas. Only when a case is too crass, too hopeless, are the wishes disregarded and the type of lesson to be learned, namely to go through one’s own mistakes, is postponed for later opportunities or, perhaps, incorporated into other details of the next incarnation. So, you see, a great many details and variations are possible even in this one respect. Needless to say, according to failure or success of the life plan–whether the spirit to be incarnated or the higher authority planned it–development is speeded up or slowed down. Now, since life on earth is one long chain, and each life is nothing but a small link in it, the evaluation of the duties and tasks in each life depend on many, many circumstances. As I mentioned before, each being in existence has a record, called the Book of Life, wherein everything is inscribed. From the time this particular entity has been created up to the present, its special talents, inclinations, characteristics, and the personality trends that brought it to fall are inscribed and updated. Recorded also are all the various stages of development since the fall, not only the earth incarnations, but also all activities in-between. Each incarnation is planned carefully and meticulously according to this “general ledger.” Before each incarnation, while planning it, the whole ledger is shown to the entity. Whether or not the entity is ready to make his or her own decisions, the purpose of what should be accomplished in the following incarnation is revealed. The law of cause and effect–or the law of karma–does not necessarily work immediately in the successive life. It often happens that a cause in one life will produce its effect perhaps only three or four incarnations later. For no one is asked to bear too much at a time. I might add, however, that generally, though not always, the higher the development, the faster the effect will follow the cause. Thus, you will perhaps understand a little better when I admonish you not to judge, not to compare, and not to generalize in these matters. You can see only this one life–your own or that of another person–and even this view is a very limited one. That is why a human being is extremely foolish to try to judge the justice of the laws of God. You often feel inclined to say that something is too difficult for you to bear, or that another person has too easy a life. You would not think so for one moment if you knew the missing part of the information. It is for good reasons that, for the sake of your own spiritual development, the curtain must be drawn until you have worked yourself up to a state of consciousness where information of this sort is good for you and for those around you. Therefore, have the humility to withhold judgement. 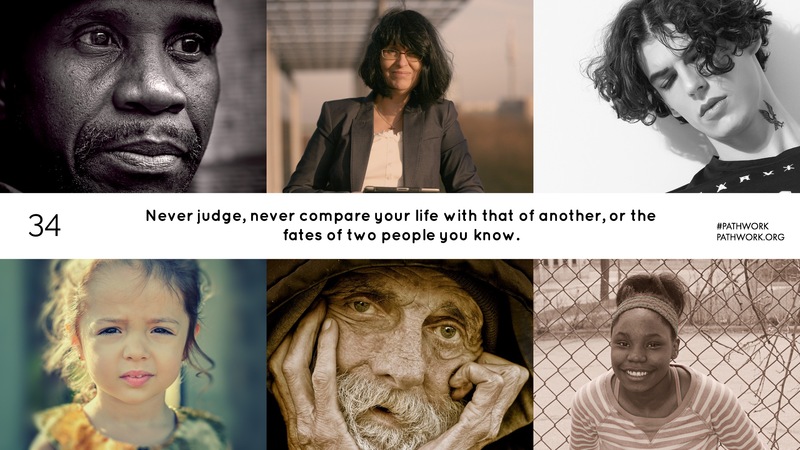 May this be a lesson to all my friends who hear or read these words: Never judge, never compare your life with that of another, or the fates of two people you know. If you seem to bear a heavier cross, it is because more can be expected of you. You are stronger; you are already farther up the ladder. Or it might also be that you, if you happen to be an ambitious person, have chosen an unnecessarily difficult life, perhaps even against the advice of an angel of God. Consider that, my friends. I started this lecture by telling you that you are already preparing your next incarnation now. I spoke the truth. How much of the plan you now fulfill determines what opportunities will be afforded you, in your next life, to turn to other things necessary for your overall development. If you do not advance this time at all or do so only partly, the purpose of your present incarnation will have to be repeated at least in part. On the other hand, it also happens occasionally that a person fulfills a little more than he or she set out to do, or brings the plan to fulfillment before the life span is over. In this case, what was meant to be accomplished in the following incarnation can already be started now. It goes without saying that this also changes the plan for the next incarnation, since that has been drawn only roughly as an overall blueprint, subject to change in any direction until the time of incarnation actually arrives. Again, beware of rash judgment; an easy and pleasant life is not always an indication that your last incarnation was a very good one. It may be the result of merits you have earned three or four incarnations ago. Similarly, a very difficult life may or may not be the result of actions in your last incarnation. Furthermore, a demerit may be paid off in one lifetime by a zealous person, while another pays off just as great a demerit, or perhaps even a greater one, in several stages. This, too, makes it impossible for you to judge and compare. All this should be both food for thought and material for meditation. The meditation should make it clear that you have many chances on this earth to make changes for the better in your personal life plan. It is up to you to annul accumulated bad karma. You can do it quicker if you fully realize what this life is all about. When life on the earth plane is finished, an account is made; everything is minutely and justly checked so that there can be no difference of opinion or argument about it. For everything is out in the open in the spirit world. It cannot be that one opinion stands against another. Your deeds, your thoughts, your feelings, your reactions and your attitudes create definite forms that are as substantial and visible as any material object is to you at present and even more so. As two normal people would not argue whether a round table in front of them is round or square–as though this were a matter of opinion–the forms perceptible in spirit cannot be argued about. Do not misunderstand me: there is no prohibition of argument. It is not that the spirits of higher development have a dictatorial attitude, but that you can see for yourself the truth right in front of your eyes, no matter how much you have tried to deceive yourself as long as you were hidden in matter. When the full account is made and carefully considered, it is compared with the original plan for the past incarnation, as well as with the overall plan for the entity in question. The negative trends and faults that were overcome and the tasks that were fulfilled are checked off. What still remains to be done will determine the next incarnation. A comparatively long time, according to your human standards, elapses before the next incarnation begins. There is a time of rest for many spirits, particularly for those who have suffered a great deal, physically, mentally, or otherwise. The time of accounting I have just mentioned can take place before the rest period or after. And then begins a period in the spirit world when the entity goes through certain schools, receives instruction according to its personal needs, and where it is put into a particular purification sphere, again according to its individual needs. The sequence of these different phases varies. There is no rule governing which phase comes first and which follows after. Purification work in the spirit world is often done in connection with incarnated human beings. This may be new for some of you. Let us suppose that the task of an entity during his last incarnation was to straighten out a relationship with another human being–perhaps to learn to love and to accept this other person–and that the task has not been entirely fulfilled. This task can often be completed, as well as possible, when one of the people is still on earth. This can happen in various ways, but I will not go into the details now, because it would lead us away from the subject. We may discuss this at another time. Purification can also take place in particular spheres that again may vary. There are many, many different levels in the beyond. Periods between incarnations can also include a time of service and the fulfilling of certain tasks in the Plan of Salvation, provided the entity has reached a certain degree of development. The different phases–such as taking account of the last incarnation and planning for the next, purification, fulfilling of tasks–may be sharply divided or the phases may interact and be combined. Of course, all this applies only to those spirits who have willingly incorporated themselves in the Divine Order. Many are on their own. They are also brought to an accounting, and planning for the incarnation to follow also takes place for them in the beyond, but all this is done on a lower level, in other spheres, and in a different manner. The same principles hold true, but the way they are applied must vary because the free will of the entity to be incorporated into the Divine Order or not must be considered. This decision influences to a great extent not only the entity’s activities in the beyond, but also its incarnations. As your spiritual consciousness is raised, you will come to discern in which category among your fellow-creatures you belong. As you can see, how the time between incarnations is spent also determines the life to follow. The length of time between incarnations may vary as well. I want to emphasize here that justice is complete in all cases. For all who still find themselves in the cycle of incarnation, the time comes for rebirth on earth. At that moment the entity is brought again to the authority in charge of its whole cycle, who has arranged previous incarnations with the entity and done the accounting after the last one. Now its particular personal ledger is again examined along with the temporary plans that had been designed for the next life–subject to change according to the attitudes and activities of the being since the plan was constructed. At this point the final plan is made for the incarnation to come, and this of course takes considerable time. The proper choice of parents, nationality, religion into which to be born, life circumstances, certain phases in life that are called “fated” are considered and set down. All these choices are made in the most practical way. For instance, parents may be chosen to afford an environment best suited to bring out certain disharmonies in the soul. For that purpose the next life needs certain imperfections in the environment, for if everything were perfect, the shortcomings would not have an opportunity to come to the surface. At the same time, the parents may also be karmically linked to the entity, so that a karmic debt may be paid off. Difficulties and advantages in the life to follow are considered from the point of view of the overall plan. It is carefully weighed how much should be taken on; how much the entity should concentrate in this life on one character trend, or whether it would perhaps be better to concentrate on a heretofore unsolved psychological problem. For entities of higher development–all this is, of course, relative–tasks for the Plan of Salvation are planned so that they may best combine with the entity’s own purification problems. Some talents are chosen to be brought forth; others are planned to remain hidden in this particular earth life. When all has been considered, the entity is given the chance to make its own choice in certain respects, and where it cannot possibly make its own choice yet, it is nevertheless asked how it would choose if it could. As I said before, the choices of the entity are never denied dogmatically, and the reasons for the denial are always conscientiously explained. After an intensive period of study, the final plan is made for the life on earth to come. Special spirits are sent to various places–also on earth–to smooth the way and to make preparations by guidance and inspiration. Once in a while they may report back that conditions are not as hoped for and are therefore unsuitable for the purpose of this incarnation; then other karmic ties are used for this life that would have been concentrated on in a later incarnation if the first circumstances considered had turned out as expected. When the plan is finally set down and the conditions and preparations on earth checked, the entity is led into a different sphere. It is a great, great sphere, consisting mainly of what you might call, in your earth language, a hospital. Spiritual physicians are working there. Many physicians on the earth plane have been incarnated from such hospital spheres existing on various levels. They learn in these spheres. However, a great number of spirits are also active there who are out of the cycle of incarnations, as well as some who have never been in it. They have more responsible tasks. Others learn under them. The hospital sphere consists of several parts. To mention just one–there is one department to which spirits are brought who have died in an accident or whose life ended in another type of sudden and violent death. In such cases their fluid bodies may be injured and they are then nursed back to health, if I may use this expression, before they begin their activities in the spirit world. This is just one of the many parts of this sphere. In a large section the lives on earth are prepared. The entity ready for incarnation appears there before a certain spirit who has high authority and great responsibility. The entity to be incarnated comes in contact with his guardian spirit or spirits; it may be the same one that has guided him or her through several lives before, or it may be a different one. It will certainly be the one who will lead him through the coming life. The guardian delivers the plan to the spirit in charge in this sphere, who again studies the plan carefully. The spirit will then call some assistants who will work on this entity. And again, everything is discussed minutely, and plans and preparations are made. My dear friends, I can sense that some of you think that all this is impossible. It sounds too human, too concrete for you to be believable. Yet, as the saying goes: truth is often stranger than fiction! And this is the way it is; although again it is different–different from what is on earth and from what you can imagine. The words I use are closest to what I am attempting to describe. All these spheres and hospitals and physicians and higher placed authorities and assistants and ledgers and plans–all this exists. For you have nothing on your earth plane that is not a poor copy of what exists first in spirit, even if in a somewhat different way. Now, when the plan has been carefully studied and the preparations made, the entity to be incarnated waits until conception has taken place. For the conception, astrological factors are taken into consideration, as well as a number of other details of which you either know very little or which you completely ignore. Conception by the future parents cannot happen unless it is the will of God. If a conception today is not to serve a definite purpose for the entity to come into your world, it will be prevented by spiritual means, though it may take place next month. And then, according to the so-called genes of the parents, which of course have been studied beforehand and which must again be in alignment with the entity to be born, certain magnetic fields, rays, fluids get to work–partly automatically as an effect of causes set in motion, and partly administered by spirit helpers. This is extremely difficult to explain to you. The moment conception has taken place, the entity to be born is made unconscious. It is in such a deep state of unconsciousness that a great part of its knowledge will only come back after life on earth has been completed; another part of knowledge will come back during earth life, but only when the entity leaves the body–in other words, during sleep. Also, consciousness will gradually and slowly awaken in an incarnated human being during the process of growing up. That all this can happen in exactly that way is due to preparations with certain types of fluids in the entity that are being made by the experts in the sphere I have described for you. It requires exact measurement and a certain way of treatment of these fluids and a highly specialized form of processing; there is a refraction and an extension of fluids. There are different types of fluids, each representing a different facet of the personality. Let us talk first about the physical aspects of the human being to be incarnated. The parental genes are made to correspond to and affect the physical shell. In the meantime, the entity to be born is growing in the body of the mother in such a way that its physical karmic necessities can be fulfilled. There is no coincidence possible. Nothing is left to itself. And when it says in the Bible that God has counted every single hair on your head, it is no exaggeration, my friends. You should understand it in this sense. For every smallest detail has to correspond, because it has a meaning, a much deeper meaning and significance than you can possibly imagine. Symbolism does not work the way humanity thinks it does. It is mostly the other way around. Your bodies are often symbols in one way or another of your spiritual development, psychological trends, and so forth. But beware of rules and generalizations here. There are none. So the genes are worked on in such a way that the shell is prepared properly. Some genes will therefore have an influence; some will not. In one instance the genes of the mother have a greater influence, in another those of the father. In one instance genes of the parents do not work at all, in another case, the genes of a grandparent, or even a great aunt may all of a sudden be at work. All this is not arbitrary or left to coincidence. For every detail there is a reason. The physical shell grows in the mother’s body, although there is no spirit in it, but the procedure or preparation proceeds according to the rays, the magnetic fields that work their effect corresponding to the purpose of the treatment in this particular sphere; everything takes place exactly according to plan. Also, many other factors are taken into consideration. Certain highly trained specialists concentrate on the physical shell. Other specialists, equally trained, concentrate on psychological and spiritual factors. It occurs also that through the treatment of certain other fluids some consciousness will return as the human being grows while other types of consciousness must remain hidden. Thus, one person will grow up with a strong feeling of God-consciousness, perhaps even in spite of atheistic and materialistic parental and other influences. In another case, it is the other way around. In some instances, there is a strong urge to become, let us say, an artist or a scientist, in spite of contrary environmental influences in youth. This is due to the effect of certain fluidal matter that has been prepared before birth. This preparation determines what urges, trends, and leanings should come to the surface at what period. Other fluids are prepared and processed in a way that is conditional on whether other factors have been fulfilled or not. You can perhaps vaguely glimpse how infinitely complicated and exact this preparation of the so-called soul must be. As you know, the faults that have been planned for the person to work on in this life are energies or currents. These are treated in the fluidal bodies in such a way that they need very little outer challenge to come to the surface. The outer challenges are provided for in the choice of parents and other conditions in the incarnation. If faults remain dormant in the depth of your soul, you cannot become aware of them, and if you are not aware of them, you cannot overcome them. Not all problems or faults are prepared for raising to the surface. Some are supposed to remain hidden, to be worked on in a future incarnation or, as I said, only if and when the plan of this life has been fulfilled. All this must be carefully studied in the plan by the experts and prepared properly. The same applies, of course, to talents, to psychological problems and other complexities. Some are prepared so lightly that they will arise immediately, others only after definite conditions are fulfilled. This preparation in the fluidal bodies will perhaps be easier to understand if you think of each quality, each trend, each attitude, good or bad, as a power current, which it truly is. It depends very much on how the power currents are treated, insulated, or channeled. All this may serve as an explanation for some of you who have seen in your family or in your environment a great change in someone who has always been known to be a very decent person, conscious of his shortcomings, working at them, and obviously making great spiritual progress. All of a sudden something unexpected and apparently quite new comes to the surface. Everyone is shocked and disappointed. From now on you will understand that this is often due to the fact that this person has worked spiritually very well. After work has been accomplished on trends that were on the surface, other trends, left deeper embedded by the spirit helpers, can now emerge to be worked on in the purification process. This is exactly why people on a spiritual path often display at certain periods trends that have never been noticed before. Of course, this may also be due to their having been hidden by the mask self. On the other hand, these trends may have been left to emerge only after certain other things have been accomplished. The same may apply to a good trend or a talent. The spirit specialists examine their charts exactly. In one case a strong talent is supposed to come out very soon and it has to be prepared. In another case, a talent is left inactive, and may only emerge depending on certain circumstances and on whether or not the person is following through on the plan. All this is shown on the chart, and the fluids have to be prepared and processed accordingly, which is an exceedingly difficult procedure impossible for you to grasp entirely. The period of processing and treatment of the fluidal bodies takes approximately nine months, the time the human shell needs to grow. Sometimes the processing is completed a little before the nine months are over; then the entity is just waiting in an unconscious state. Sometimes life needs to start a little earlier because the conditions to begin life may be more suitable, and the parents also fulfill the best conditions for a premature birth. In such a case a premature birth will occur. In other instances, birth may be delayed a little. At this point I would like to add one more detail. During the time of pregnancy, the attitude of the mother, as well as that of the father, may often determine a change. If the parents, or even one of the parents, should change their spiritual attitude, then the entity first planned for these parents would not fit into those circumstances any more. This may be because, if their spiritual attitude has changed for the better, the parents now deserve a higher-developed spirit as their child. It may also be that the being first destined for these parents will not find the necessary fulfillment with parents having a spiritualized outlook. Enough parents are available whose attitude would offer the limitations that the particular entity needs for growth. Fewer, indeed, will present the proper environment for a spirit who has more to give to the world. This is also a task and a responsibility for the parents. They have to be worthy to rear a child who has greater tasks to fulfill. Such worthiness is often determined by the spiritualized way of looking at life. So, last-minute changes can be made if the mother, or the father, or both, change their attitude during pregnancy, either for the better or for the worse. Enough possibilities are available for such changes to be effected. The spirit world can foresee fairly well whether or not such changes are within the realm of the possible, knowing the capacities of each soul much better than the human beings themselves, because the Book of Life is available there. So tentative arrangements may be made already during the time of pregnancy. For instance, should the first chosen parents change enough during the time of preparation for birth to warrant their receiving a different child, the first intended child will go without difficulty or delay to another pregnant woman. Therefore, it is advisable for the mother in particular to become quiet within, to turn to God, and to spiritualize her whole being and attitude during pregnancy. When finally the time of birth arrives, many spirits assist, so that the fluidal bodies that have been treated in the manner described enter the body of the baby. Then the incarnation has been effected. Are there any questions about this? QUESTION: Yes. How is it possible that sometimes babies die at birth after they have already received their souls, so to say? ANSWER: There are many possible reasons for that. In the first place, it may be that it is a karma for the parents, a test through which they have to pass. But the spirit of the baby will not have gone through this procedure for nothing. That the first mother would lose her child was known in the spirit world, and the parents with whom the baby would finally settle down have already been chosen before the first birth occurred. The spirit of the baby will thus have fulfilled an additional little task by going through this experience, even though it is unaware of it since it is in a state of unconsciousness. Nevertheless, this is not done without the consent of the spirit to be incarnated before it undergoes the birth process. It will mean a merit for the spirit who makes itself available as an instrument of fate, so to speak, for the parents it so shortly visits. There may be other reasons too. The possibilities are numerous. For instance, the parents may not have lived up to certain promises made in the spirit world. However, it may also be that the parents have fulfilled more, spiritually speaking, than was expected of them and thus are ready to bear this cross and test which otherwise would have been too much for them. This will further their development. So such a thing may either happen because the parents fulfill less or because they fulfill more than originally planned. In either case, later on something better may follow. As far as the baby is concerned, after its physical death there will be a comparatively uncomplicated process whereby the fluids will be retracted a little, certain adjustments will be made, and without gaining consciousness, birth will occur with the other parents, chosen as permanent hosts in the first place. QUESTION: We have now two and-a-half billion people on this earth. According to any reliable census, this is the maximum we can have. This must mean a rapidly increasing number on the other side. Now, probably every human being has the same allotment, or is that not so? ANSWER: Certainly. You see, my dear friend, the Spirit World is so vast that you cannot have an idea of it. There are so many worlds, so many spheres, and so very very many spirit beings, of all types of development. There is really enough for everyone. You can be quite sure of that. There are many many more spirits than the number of human beings that will ever exist. QUESTION: Is it true what Theosophy teaches, that the reservoir of spirits to be incarnated holds about three times the number of the present earth population? spirits to be incarnated? ANSWER: My dear friend, I have not counted them and I am not curious to know the number. So I could not possibly give you an answer here. I do not know it. If it would be important, I would make my inquiries. ANSWER: Exactly. So I think that takes care of that question. QUESTION: Is it correct that birth, and time and form of death, are determined by an unchangeable destiny? ANSWER: No, it is not correct. As to birth, I have just explained how it is, so I do not have to go into that any further. And, as you have heard, even that can be changed in the last moment. And the time and circumstances of death can also be changed. As I said to you, there is a plan for each life. But I also told you that there are many plans. There is a plan for every alternative, every possibility of free-will decision. Let us say, an entity fulfills the most he or she was expected to. For that alternative there is one plan. Another plan has been made for the eventuality that he fulfills even more than the best that could be expected. That exists occasionally too. There are several other plans for partial fulfillments, or if he does not fulfill anything. Perhaps a person will straighten out a karmic debt, but will not overcome a certain weakness or solve a psychological problem. The time of death does not vary according to which plan is fulfilled, but the time and manner of death varies according to which plan has come true. Again, I wish to emphasize that the fact that life can be longer than projected in one of the plans is not always a sign that this longer life has been fulfilled at its best, though it may be so. If an entity really fulfills his or her very best, his life may be prolonged because through his special fulfillment he may have possibilities to help others. But then, again, a life may be cut shorter because the entity has fulfilled his or her best. Then the favor is granted to return home sooner, to begin something new, a task that he or she has been waiting for. Therefore one cannot bluntly say that an unforeseen prolongation of life is necessarily a proof of good fulfillment. It may be that way, but it may also be exactly the opposite. So the time, as well as the form of death, can vary according to which of the many alternatives the entity has chosen. QUESTION: This would explain the astrological riddle that sometimes death does not occur according to the usual progressions. ANSWER: Exactly. You see, my dear friend, perhaps now, with the help of the teachings you receive here, you will be able to understand many things in astrology that were not quite clear before. It may be very good to adopt right now the idea that each human being has necessarily been given many alternative plans for a life. This will also clear up another question, namely, why some aspects “work,” as you say, and some do not. That is so because astrology does not contain all plans. Some are found in domains not yet known to humankind. Perhaps you can fit this into your picture. QUESTION: Last time the question was asked whether a total destruction of entities, souls, took place before the salvation through Jesus Christ. ANSWER: There never was a total destruction of a single soul. Never. No created being has ever been totally destroyed, not even Lucifer. QUESTION: Did Dante’s prophecy of the Veltro refer to the coming of the Holy Ghost as predicted in de Fiore’s Eternal Gospel, and is that Veltro taken from the Vangelo Eterno, in other words, the coming of the Holy Ghost? ANSWER: I may answer the question only in the following way–for there are certain spiritual laws that bind me to the kind of statements I am allowed to make. The answer may already be partly clear by my having mentioned these various plans. Different clairvoyants, seers, or otherwise psychically gifted people have seen one plan, others have seen another plan, and that should explain why one clairvoyant can be right in many instances and wrong in others. In the latter case he or she just happened to see a plan that did not come true, due perhaps to an unexpected change on the part of one or several human beings. Here I would like to say this: It is, of course, the general plan of development for the whole Plan of Salvation that humanity will come to a point–how soon is difficult to say–when an intermediary human authority between man and God will no longer be necessary. Then the various churches and religious organizations will teach their followers in a way similar to how I am teaching you now, that is, to cultivate and obtain direct contact with the Divine World. This may not necessarily be through mediumship, which is only direct for the medium, but through spiritual development and the refinement of the inner senses. The religions will subtly, gradually, but surely change in the centuries to come. You can observe this trend already. Some time ago, people killed each other just because they thought differently. Yesterday, they hated each other but did no longer kill because of their different ways to come to God. Yet, whoever was in power would still enforce his belief and prohibit the others. Today, humanity has come far enough, so that people begin to tolerate one another. They still feel that there is something to “tolerate”–the other fellow’s different conceptions–nevertheless, this is a great step forward. Tomorrow they will not feel they have to tolerate one another, rather, they will see the one truth that underlies all religions. Religion will no longer be a separating factor. And that is the Age of the Holy Spirit that is referred to in your question. This era, in all probability, will not come about by destroying the existing religions suddenly. As Jesus has said, he did not come to destroy. People will change from within, gradually, in the only way positive and constructive growth can ever take place. And this is what was foreseen and expressed in this prophecy. Does that answer your question? QUESTIONER: Yes, except the last part, whether the Veltro actually refers to the prophecy by Joachim de Fiore. ANSWER: That I am not allowed to answer. If you study it carefully, you may be able to sense the truth. It is possible that you are inspired. But it would be against spiritual law if I gave you a simple yes or no. Perhaps it is difficult for you to understand why, since this is all new to you. But that is the way it is. You see, it is our purpose to further spiritual development, directly or indirectly, and we are only allowed to answer questions that do that. But if knowing the answer to your question has for your work a particular importance, I would advise you to ask your guardian spirit to inspire you. And you will receive the answer. QUESTION: My question concerns the prolongation of life through science, the extension of the life span and the elimination of child death. Since everything is so beautifully planned, how is it that science claims to have some part in the extension of life? ANSWER: Science can find only what God’s Spirit World allows it to find. This permission depends on two factors: One is that the findings have to fit into the general plan, concerning the entire earth sphere at any particular given time. The other factor is that the human beings in question, in this case the scientists, make the necessary effort. Effort is always an integral part and constitutes the first step. The same holds true, as mentioned before, for reaching for contact with the Divine World by an individual or a group. If the effort is not made on the human side, if the human attitude does not fulfill the basic requirements, the Spirit World cannot do its part. Similarly, I can speak through this human person only because of her efforts. If she refused to sit down here, I could not do anything to come through here. It is the same with a scientist, or an artist for that matter. With all his talent, he cannot accomplish anything quite by himself. He or she must have spiritual helpers who can manifest only if he is fulfilling the necessary requirements. Now, if science is discovering today so many new things, it is because this fits into the present stage of development. There must always be some leeway to see what humanity does with such findings, whether they are used for good or for evil, selfish, destructive purposes. In the latter case, material progress will ultimately wither away, as it has happened before. So, if life is longer, it is because it fits into the whole picture of overall development. Since humanity as a whole is farther advanced, people may accomplish more in one lifetime–and that works hand in hand with the technical and scientific improvements which, in turn, will only bear fruit if spiritual improvement follows, at least to some degree. So science on the whole, or the scientist individually, is to be taken but as an instrument. And now, my friends, I will retire. I will not speak to you for a short while but this should not mean, must not mean, that you are cut off from the World of God. You yourself should make an effort to remain in touch with it in your thoughts, your efforts, and in your times of inner quietness. Continue to search in your heart for the spiritual truth you need to solve your problems and your life. The more you seek, the more will be given onto you. You are never alone if you reach out for God’s spirits who are constantly around you, waiting for you. Blessings for all my friends, for your bodies, for your souls, and for your spirits. Be in peace, God bless you, be in God!